Baggage Capacity 72 cu. ft. The Hawker 1000 is a super mid corporate jet charter with intercontinental range capabilities and comfortable seating for up to 9 passengers. The cabin of this business jet charter can come in a traditional or a biomorphic design. The biomorphic design has smooth curves, and it increases passenger comfort and useful space. The cabin stretches to 24.4 feet long (not including the cockpit), 17.1 feet high, and 6 feet wide. 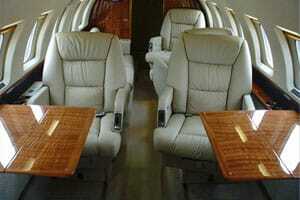 This private jet charter is usually configured to hold nine seats but can hold as many as fifteen when necessary. Two Pratt & Whitney Canada PW305 turbofan engines power the Hawker 1000, our leading business jet charter, providing 5,255 pounds of thrust each on takeoff. A new design to reduce engine noise puts out the exhaust at a slower velocity, thus producing only 90 EPNdB for a noise footprint of 1.6 square miles (a noise footprint is an area in which listeners would be significantly affected by jet engine noise). For comparison to this private jet charter, the noise footprint of a typical twin turboprop would be 4.2 square miles. The Hawker 1000 can take off in 5,950 feet at sea level and in 8,075 feet at an altitude of 5,000 feet. 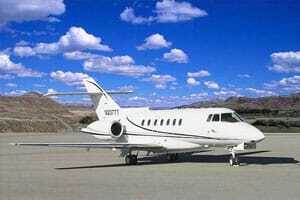 This corporate jet charter can cruise at up to 453 knots (.68 Mach) at an elevation of 37,000 feet. Its long-range cruise speed is 400 knots (.60 Mach) while flying at 41,000 feet. The Hawker 1000 has a maximum range of 3,530 miles (3,071 nautical miles). You can reserve this private jet charter from JetOptions by contacting us today.